The JSE managed to keep its head above water for the better part of 2018, with a modestly positive cumulative return going into September. However, the last part of the year proved particularly tough, with the JSE All Share Index (ALSI) falling 13.1% over the three months to end November, before experiencing a relief rally through December. 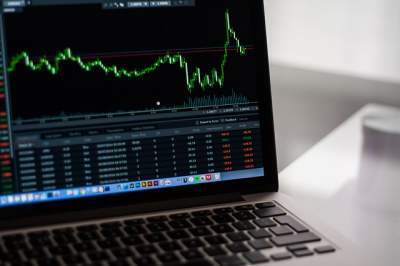 All told, the ALSI fell 8.5% in 2018, while the shareholder weighted index (SWIX) slumped by 11.7% over the 12 months. Investors in local equities were not alone, as 2018 was a hard year for equity investors across the globe. 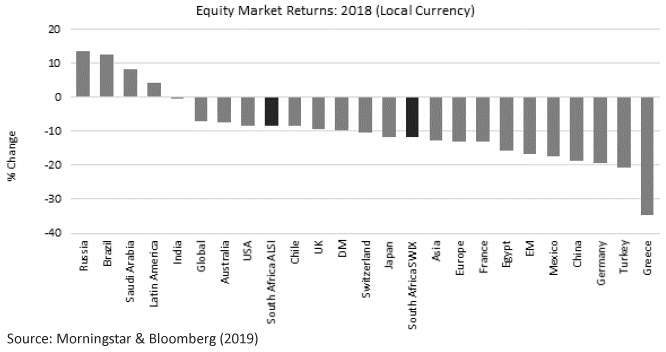 Measured in local currencies, global equity markets saw an average decline of 7.2% in 2018, with few countries reporting gains. The Brexit-beleaguered UK market fell 9.4% and the German DAX, caught in the crossfire of Trump’s trade war with China, fell 19.3%. The only markets of any consequence that were in positive territory – including Saudi Arabia, Russia and Brazil – had a single factor in common: oil. Having walked the hard yards, the upside is that the equity selloff has resulted in attractive valuations at the market level and inside of markets. Thus, while you could top up your portfolio with a world equity index trading at 13.5 times forward earnings or a German equity tracker offering a Euro-based dividend yield of 3.5%, you might also have a look at specific stocks that offer excellent upside potential. Here are three of our top ideas for 2019. Altaba, listed on NASDAQ, is an attractive vehicle for entry into China’s Alibaba. Altaba resulted from Verizon acquiring all the internet businesses owned by Yahoo!. This effectively rendered Yahoo! an investment holding company, owning shares in Alibaba and Yahoo! Japan. Subsequently Yahoo! was renamed Altaba – with the name hinting that this was “an alternative way to own Alibaba”. This “residual” business, with a market cap of $38 billion, trades at a steep discount to the net asset value (NAV) of the two core Asian assets. Since Taiwanese-American entrepreneur Jerry Yang founded Yahoo! in 1994, the firm built a habit of investing surplus cash into various entities. This included buying a $1 billion stake in Jack Ma’s Alibaba in 2005. At the time, this was regarded as a fairly contrarian call. Fast forward to 2012, however, when Yahoo! 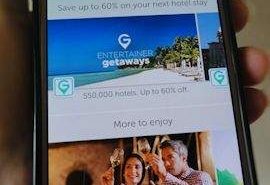 sold 50% of its Alibaba stake for $7.6 billion, and the vision of the original investment becomes apparent. Alibaba is now a highly profitable Chinese e-commerce, retail and technology business. An example of its immense pulling power is Alibaba’s $32 billion in sales on Singles Day (11 November) 2018, outselling Black Friday and Cyber Monday combined. Altaba’s second core asset, Yahoo! Japan, was formed in January 1996 with SoftBank to establish Japan’s first web portal. Profitable since its formation, Yahoo! Japan has shown steady growth with operating profit in of $480 million last year. More importantly, the entity has transformed into a major corporate with three technology-driven pillars, including a media and content business, an e-commerce business, and a data centre-related business. Essentially, Yahoo! Japan is a cutting-edge, technology-based company with a diverse and growing source of income. Investors can acquire the two superb assets underlying Altaba at just $61.00, which represents a 23.1% discount to its NAV of $76.28. Alibaba itself peaked at $210 and is currently trading at a significantly lower $146 because of the recent emerging market selloff. This represents an excellent buying opportunity for the highly profitable and fast-growing Chinese internet giant. Acquiring it at a further discount through Altaba adds a meaningful sweetener. Sabvest is an investment holding group that has been listed on the JSE since 1988. The company has an exceptional long-term investment record, having generated a return to shareholders of 54 times capital over its 30-year history under the sharp eye and steady hand of founder, Christopher Seabrooke. Despite this prodigious long-term result, Sabvest is generally unknown to South African investors, and flies under the radar. The real clout of Sabvest is captured in the long-term power of its compounding: since its listing, the company’s NAV has grown by a factor of more than 50 times, while the JSE has grown by a factor of 25 times. In the past decade, a period characterised by capital market volatility and a sluggish local economy, Sabvest’s compound annual growth rate of 21.9% per annum is an enviable result, and well ahead of the broad market. An investment of R12 500 in Sabvest in 2008 would amount to R100 000 today. However, Sabvest historically has been an illiquid stock, which has contributed to it trading at a discount to NAV of the order of 30%. Recently, though, corporate action resulted in 36.8% of the company’s total issued share capital being placed in the market, which has increased the company’s free float from around 20% to closer to 60%. 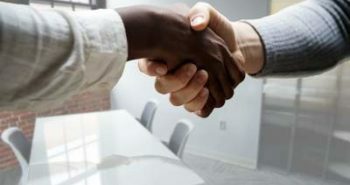 In addition, Sabvest is in the process of changing its incentive scheme to reward executives when the discount to NAV is narrowed, which aligns their interests even more closely with those of shareholders. The investment strategy targets NAV growth of 15% per annum, underpinned by dividend growth of 10% per annum. There is a long runway for the company to continue to unlock and grow intrinsic value, and we conservatively calculate Sabvest’s investment portfolio to be worth R55.80. The current market price of R39.50 makes for a compelling investment case. Telkom is a leading information and communications technology (ICT) services provider in South Africa, offering fixed-line, mobile, data and information technology services. The company trades on 10.5 times earnings with a 5.6% dividend yield. Telkom displays utility-like attributes in terms of performance, with a return on assets of 9.2% per annum and return on equity of 11.7% per annum. This makes for a reasonable investment. Ultimately, if you are using the occasion of a new year to assess and rebalance your portfolio, we believe that adding these three stocks to your holding could make for a good year. This article was based on a press release issued by Cannon Asset Managers. Next postIs The Entertainer still value for money? How do i buy the Telkom shares and what is the minimum that one should spend?